My friends Frank and Dave Samuels joined me for dinner at Gastropod, a restaurant I've been wanting to dine at since it opened a couple of years ago. It was worth the wait. I started with a Pisco Sour, a cocktail I'd first had at a Peruvian restaurant on Lake Geneva in 02. This one was just as good. Dave remembered guzzling Pisco Sours when he was in Peru long ago, but this time went for a Hoegaarden beer, as did Frank. 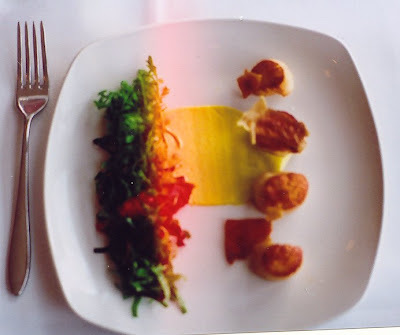 This is "seared Union Bay scallops, roaster meyer lemon vinaigrette, peppercress, arugula, saffron potato aioli." It looks better than it tasted, even with the strange light from the camera- a film camera this time. My parents used to grow Meyer lemons in their backyard in LA so I was really looking forward to the lemon component of the meal. I'm still looking. Porcini mushroom soup was on the online menu. 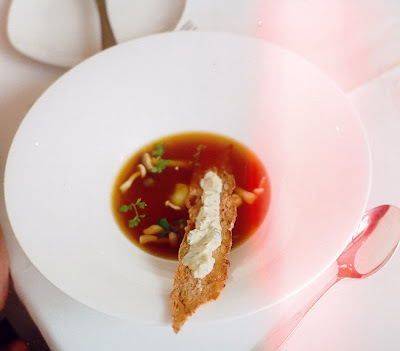 I really looked forward to what Gastropod's young chef did in contrast with Chef Pino's amazing porcini soup. Alas, it wasn't on the menu any longer. 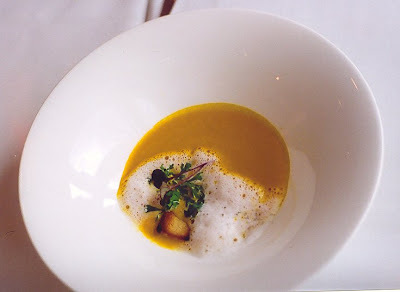 The server reccommended this, vanilla carrot soup, lavender foam, grilled cheese, which Frank feasted on. Dave had the duck consome, quail egg, pickeled brown beech mushrooms. 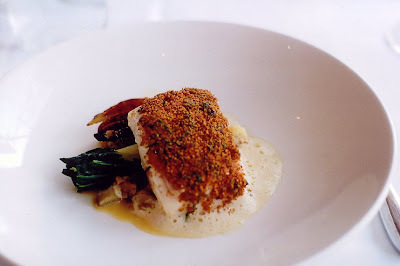 After the appetisers, I had this amazing sous-vide piece of halibut (in season now). I would never have thought of putting graham cracker crumbs on a piece of halibut but this worked wonderfully. I went home and tried it (not the sous-vide process, just the crumbs), first trying crushed Bretton crackers, than using actual graham cracker crumbs. Both worked splendidly, particularly with the cheese I cooked my fish with. One of the best things you can get out of a restaurant is an idea for something you can make yourself. 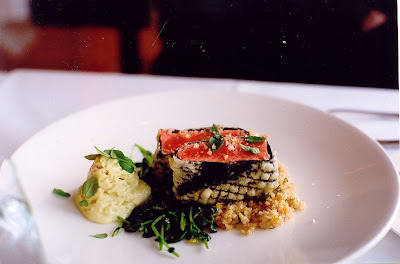 This is "wild spring salmon a la Gastropod, wasabi sabayan, pea shoots, warm citrus bulgur salad" that looked just as good as my halibut on my friend's plate. I didn't get to sample any of my friends' meals but they sure looked good. Maybe it's the film camera.